Now, as slick as the Samsung Galaxy S 5’s system for linking your contacts is, it isn’t perfect. In this scenario, both contacts have the same first and last name. However, if the same person also goes by a different name, you have to link these contacts. 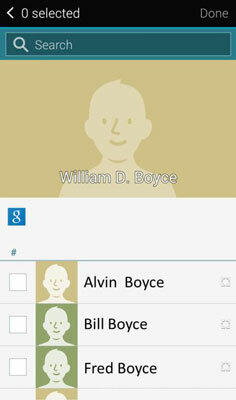 For example, if you created a contact for Bill Boyce, but in your e-mail you refers to him as William D. Boyce, your phone will assume that these are two different people, even though you know these contacts are for the same person. From one of the contacts, tap on the chain icon. This brings up the pop-up screen prompting you to link the contacts. Choose the contact whose name you want to be the primary name. For example, in the example the chain on the William D. Boyce contact was tapped. That will be the name used on the combined contact going forward. Tap the Join another Contact button at the bottom of the screen. Your phone will try to help you with some suggestions. 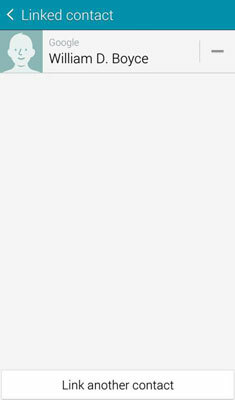 If it gets it all wrong, you can just find the other contact by searching alphabetically. Tap the Contact you want joined. In this case, the second guess, Bill Boyce, is the one you want. Tap this name. This combined link you just created has all the information on this one person.